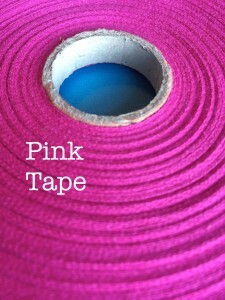 Pink Tape is written by Lucy Reed, a family law barrister *waves*. On this blog you will see me identified as 'Familoo' (a concatenation of 'family' and 'Loo'. A moment of poor judgment right there). I have been at the family bar for 15 years and am still amazed at how little most people understand about the work that I do and what goes on inside the Family Courts (with others I set up The Transparency Project to try and begin to tackle this). More recently Chambers & Partners say : "Lucy is humane, sensible and crafts her submissions with precision and insight." and that I "Combine... a massive intellect with really meticulous forensic preparation, and [have] enormous humanity as well." I am also the author of The Family Court Without a Lawyer - A Handbook for Litigants in Person. If you are really that interested in my CV you can read it elsewhere. Pink Tape is not just about family law: I post about what interests me and whilst that is largely family law, it also includes non-family legal stuff, non-legal family stuff and stuff totally unrelated to either law or family. I'd love to think that this blog will persuade at least one person we aren't all the money hungry sharks you think we are. Some of us are quite nice really. And I'd like to think that I can provide some useful information about family law for those working in the area without getting too heavy or boring. An emerging purpose behind the blog is to enhance the quality of public information and debate about legal matters. There is some great journalism out there, from law reporting and legal commentary to simple reporting of legal stories. But there is also some terrible, sloppy, malicious and inaccurate journalism. They should know better and do better. Not everyone likes Pink Tape or family lawyers in general. In October 2012 I won the Jordans Family Law Readers Commentary Award for my "entertaining and informative" blog, having been shortlisted for the Family Law Most Innovative Family Lawyer award two years running. I was shortlisted in 2013 for the commentary award. I now also write at The Transparency Project. In 2016 I was named the Bristol Law Society's barrister of the year. Of course, everything on the blog is suitably anonymised (or made up) so that nobody (including me) gets into hot water. Where necessary I have tweaked facts to ensure that individual cases are not identifiable. I will not post comments that in my opinion offend against the law in respect of the privacy of family proceedings. Individuals involved in proceedings will not be identified by me or in comments unless they have been identified in a published judgment. I will not publish anything which I think might have potential to be defamatory. I don't have time to research every assertion made in a comment - so I have to adopt a cautious approach in order to avoid (hopefully) costly legal proceedings or nasty threatening letters. If you are confident it's not defamatory you are free to publish it yourself elsewhere at your own risk. Nothing in this blog is intended to constitute or be taken as legal advice, so please don't treat it as such. You may think it applies to your particular circumstances but it almost certainly doesn't and I cannot accept responsibility for any reliance you may place upon its contents. The information contained on the blog is as up to date and accurate as I can make it given my other commitments - Pink Tape is a hobby which I fit in as and when. This means I cannot and do not cover all changes to the law or update information that becomes outdated or obsolete. And of course I cannot be responsible for the content of sites linked to from this blog, either in terms of their accuracy or the views expressed on them. Moderation - Unfortunately I've had to start moderating comments on this blog. Please be assured I don't plan to block sensible contributions to a discussion, whether the contributors agree with me or not - but I will weed out comments that are seeking to exploit this blog as a forum to air their own negative views about lawyers in a repetitive or offensive manner. I will try and moderate as quickly as possible. Occasionally something gets lost in spam and disappears into the ether. It is not a conspiracy. Right of Reply - I try to be careful and fair with my posts on this blog and try to avoid causing upset to individuals, but if there is any post concerning you as an individual that contains an inaccuracy or mistake that you would like me to correct please post a comment and I will give you a right of reply. I will usually only edit or reject comments that contain offensive material or material which the law or rules of court prevent me from publishing. Copyright - what I publish on this blog is my intellectual* property. Usually, if you ask if you can repost my stuff elsewhere I will agree. But please don't do it without asking. Please feel free to email me with suggestions for topics I could cover or blog posts you'd like to see (email: familoo at pinktape dot co dot uk). Family Courts… are these the same Family Courts that Christopher Booker et al have been dragging into the spotlight recently? I retired 3 years ago having spent 35 years as a Social Worker in Private Family Law and also in Public Law as a Guardian. I still do some work in a Contact Centre and am concerned about the future of this provision. I think that arguably Contact Centres and Mediation Services do more for the well being of children than Cafcass. Whilst the funding for Contact Centres in these times of austerity is critical I see more and more expensive red tape being created by Cafcass for Centres and the latest idea of inspections by the Children’s Board as just another costly idea that diverts funds. Historically the adoption of the Guardian model for Private Family Law was, with the benefit of hindsight and in my opinion, inappropriate for Cafcass interventions. ‘Putting the Child First’ is fine as a slogan but in private Law it only identifies the issue. In my view a more hollistic approach is required which involves all members of the family. Whilst not perfect the family, it seems to me, is still generally speaking the best place to raise children whether it is intact or not. I have lost contact with my daughter for whom I was main carer. CAFCASS lies/self-interest, court bias, gross selfishness of her mother pandered to, the works. But you know the whole system is based on divide and mi5-rule and that includes the playing of ‘rights’ off against one-another. I’m not interested in playing that losing game to the benefit of a cynical hierarchy, interested only in control. We need a return to democracy, common sense and reason. The whole political correctness phenomenon is just the same old divisive game with a ‘progressive’ label designed to destroy freedom. The father’s rights campaign is sadly a total red-herring… ‘move away from the light’ and see the thing for what it is. “It” is certainly is not out to favour women, simply use them to destroy their own families. If it weren’t for CAFCASS myself and my partner would be facing a very unsure and stressful future! Hats off to the G for her honesty and fairness at our hearing which saw us winning against the LA! Nearly two years on and more and more contact centres are closing. A particularly highly rated one in Manchester is about to close and this will leave parents, social workers and the courts with a huge gap in practical facilities for helping family members to continue their relationship post separation. I continue to see Cafcass announcing the awards it has achieved perhaps it could channel its brilliance into maintaining essential facilities. Often parents are now have to pay to see their children which is deplorable especially considering the devastating financial impact of family breakdown. All very well having glossy booklets and parenting plans (not a new idea by any means) but that’s easy stuff get back to the practical basics of hands on intervention. Came across your blog while randomly surfing the internet. The link you have given linking your profile at St. John’s Chamber is broker. While your name appears at St. John’s Chamber’s website, the link is different. In 2012 I read your blog eventually buying your book for my partner. It was very helpful especially when the money ran out and he began to represent himself. I have been re reading this as our problems are really no nearer being sorted out. We are now on the 8th /9th contact order which has been broken again within two months, despite threats of residency and prison from the judge. Watching my partner going through this torture is heartbreaking. What can this be doing to his child? The system is all he has and I am grateful that you have let us see some positive outcomes, from his point of view. The amount of public money for: police investigations, social services investigations, MASH referrals, GP letters, school letters, not forgetting Cafcass reports and court time is crazy although I guess sometimes necessary. Fortunately, I have a friend who at the beginning of the court process told me how emotionally draining this would be, she even predicted the accusations that would be made against my partner accurately. This from my point of view has been incredibly helpful. Thank you again Lucy for the blog on the system and thank you my friend for the accurate predictions of my partners ex partners game playing!! Glad it was useful, although I’m sorry to hear how protracted and stressful it continues to be for you both. Best of luck with it. to any of my facts based on meetings between counsillors, school welfare officers and what the children will describe after one to one sessions ! I am absolutely disgusted . If you have heard a CAFCASS officer discussing you in discriminatory terms I would suggest that if you have not already done so you make a written note of what you overheard and make a complaint, requesting a new officer to deal with your case. They discriminating against me on grounds of class as I mentioned a share fraud case . Said I was rich and wealthy ! I’m broke . They laughed about my allegations of harm towards the children , ridiculed mental abuse with hysterical laughter . Discriminated against me because I can’t afford to go to another town for hearing , and it’s 2 pm and I can’t get back to get children . Formed biased opinions tegarding abandonment by the dad without seeing my evidence and it was totally humiliating and I feel I won’t get a right to a fair trial . On top of that they said ‘racist, who isn’t ! Took my children’s racially abusing views by the father pushed on them as acceptable ! . They are running scared as going straight to the top . The more I read the more I’m really worrying they won’t take any evidence or children’s wishes into account . I’m terrified . They said they have never had this happen before and going to the top of complaints . It will not take away my anxiety though to move forward . If a parent suffers from anxiety is this a mental disorder. If the said parent signed Undertakings to not communicate with resident parent but had to break undertakings to try and comply with a court order, is that punishable in law? Kerrie, I can’t give legal advice here but in broad terms I think it would be unlikely that if you are stuck between two conflicting court orders/undertakings and have to break one of them you are unlikely to be punished for not achieving the impossible. If there is a conflict I would suggest raising this with the court and asking to be relieved of one or other obligation. I am a grandmother who has been fighting for contact with my grandson, when I went to court for the first hearing I was granted leave of court in lines with the government guidelines. Unfortunately I had the misfortune to be appointed a cafass officer who took an immediate dislike to me, as you can imagine I have not made any progress since it started in 2015 , all she allowed me was indirect contact, in Dec 2016 I took the parents back to court because they broke the contact order by refusing to collect my grandson’s post from dept. if they were not at home when they were delivered. I asked for a monitoring order to be applied to court order, cafcass officer refused then decided my leave of court should be taken away from me, which the court went along with. I don’t know what guidelines you are referring to. A judge makes a decision about granting leave to apply for an order based on s10 Children Act 1989. That decision is the judge’s but sometimes Cafcass might be asked for their view on it. The view of cafcass might be influential but it isn’t up to them to make the decision. That is for the judge. I have a good solicitor working for me, however for Children Arrangements order, should I contact my own Barrister who can get the things done speedily and how much does it Cost? If you have a solicitor you should ask your solicitor to arrange a barrister (if required). If you have a solicitor on board a barrister will only become involved if instructed via a solicitor – if you and your solicitor agree you need one you can obviously participate in the decision about which barrister you prefer to instruct, as ultimately its your choice. So in short – speak to your solicitor about whether you need a barrister, who is available and how you want to proceed. Would it be concerning for a caffcass officer to disclose to a father she is a feminist in the family court waiting room? Not wishing to be embroiled in the issue but more importantly is it concerning if caffcass keep changing recommendations departing from their reports at the hearing before commencement without any notice nor changes in circumstances whatsoever? It places a litigant in person under unfair standing not being able to prepare for a hearing is my thought. I don’t feel happy with Caffcass and will just leave it at that . Purchased and read your book . I would recommend with 5 stars. Thank you for reading my message. Disclosure : I too am a feminist. In answer to your question – I don’t think actually that being a feminist is something to ‘admit’ or ‘disclose’. Most of us simply take it to mean we are committed to equality and non-discrimination not women trump men. In the broadest sense if a litigant in person is being ambushed with changes of position that is unhelpful, but cafcass do sometimes have to respond to a changing picture and there are dangers too in a cafcass officer who is unwilling to change his or her mind once made up. If you need more time to think something over that has cropped up unexpectedly make sure the judge knows this. I don’t think I can really comment further. Glad the book was helpful David.